The event featured the first time meeting of a recipient and his life-saving donor. Proceeds for the event help in the fight for blood cancer cures through stem cell and bone marrow transplants. 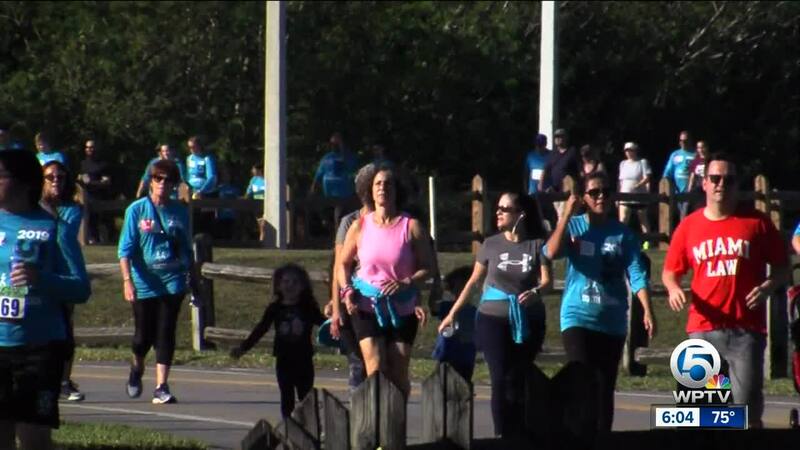 BOCA RATON, Fla. — Gift of Life Marrow Registry held its annual "Steps for Life 5K" race Sunday at the South County Regional Park in Boca Raton. Gift of Life Marrow Registry, headquartered in Boca Raton, is a public bone marrow and blood stem cell registry that helps with transplants for children and adults suffering from leukemia, lymphoma other cancers and genetic diseases. Proceeds of Sunday's event will help in the fight for blood cancer cures through stem cell and bone marrow transplants. The event featured the first time meeting of recipients and life-saving donors. “Today I had the opportunity of meeting my recipient for the first time, and it was truly an incredible experience to meet him,” said donor Ryan Corning. "Today was incredible to have met all these people involved in this organization,” said Julio Rivera, who met his donor for the first time. It's just amazing to be a part of it." Gift of Life also presented WPTV reporter Michelle Quesada, who participated in the event, with a community award.